In 2014, the U.S. saw unprecedented levels of simultaneous extreme heat in the West and cooler than average temperatures in the East, with both trends linked to global warming. 2014’s heat record is alarming in the absence of a full El Niño-Southern Oscillation (ENSO) and provides yet more evidence that that human-caused warming is now the dominant force driving changes in global temperature trends. Global warming is not only on the rise but is fueling extreme weather and unprecedented patterns of extreme temperature anomalies. Sea surface temperatures in particular are reaching record highs, driving extreme atmospheric patterns that cause heavy rainfall and floods in some countries and droughts in others. Three of the four major groups that track combined ocean and land surface global temperatures—NOAA, NASA, and the JMA— have confirmed that 2014 was the hottest year on record, even with biases that underestimate warming in the ocean and Arctic. Climate change linked to unusual temperature trends in the U.S.
2014 saw five new monthly heat records in the U.S. and was the 18th year in a row where the nationwide annual temperature average was hotter than usual. Though parts of the U.S. experienced cooler than average temperatures (a trend linked to global climate change), Alaska, Arizona, California, and Nevada each had their warmest year on record. Alarmingly, California’s annual average temperature was 2.3°C (4.1°F) above the 20th century average, shattering the old record of 1.3°C (2.3°F) by 1°C. Average annual temperature in California and the U.S.
Human-caused warming in 2014 trumped the ENSO signal. February 1985 was the last month where global temperature fell below the 20th century monthly average, making December 2014 the 358th consecutive month where global land and ocean surface temperature was above average. Each of the last three decades has been much warmer than the decade before. In the 1990s, every year was warmer than the average of the previous decade, and the 2000s were warmer still. Now, according to NOAA, thirteen out of fifteen of the hottest years on record occurred since 2000, and the two exceptions (1997 and 1998) were strong El Niño years. In 2014, six out of 12 months tied or topped previous monthly global temperature records. The combination of human-caused warming and year-to-year natural variation has generally determined which years set new temperature records. Prior to 2014, 2010 and 2005 tied for the hottest year on record, both of which were El Niño years. This makes sense because, in addition to long-term warming due to an increase in atmospheric greenhouse gases, the ENSO can bump global temperatures up or down for one to several years at a time. During El Niño events, some of the heat that gets stored in the oceans spreads out and gets released back into the atmosphere, causing large-scale atmospheric circulation changes and an increase in global temperature. La Niña periods, on the other hand, are characterized by cooler than average temperatures. What makes 2014 especially remarkable is that it set a new global temperature record during an ENSO-neutral year. From January-February 2014, sea surface temperatures were mostly below average across the eastern equatorial Pacific. By the fall, temperatures were above average, leading to speculation about the onset of an El Niño event. Scientists in the U.S. have three criteria, each of which must be met to officially declare the start of an El Niño. Conditions in the fall of 2014 met the first two criteria (that monthly sea surface temperature anomalies exceed 0.5°C and last across several seasons), but not the final criterion (observance of an atmospheric response associated with more rain over the central Pacific and less rain over Indonesia). Global annual average temperature anomalies (relative to the 1961-1990 average) for 1950-2013 based on an average of the three data sets from NASA, NOAA and the UK Met Office. Coloring indicates whether a year was classified as an El Niño year (red), an ENSO neutral year (grey) or a La Niña year (blue). This means 2014 was the hottest year on record without the added boost from a full-fledged El Niño event, and it will have been even warmer than recent years with moderate ENSO contributions (2010 and 2005). Moreover, this implies that the amount of warming due to human activity is enough to trump the natural year-to-year variation associated with the ENSO cycle. With NOAA holding there is a 50-60 percent chance of a noteworthy El Niño event developing in early 2015, there’s a good chance 2015 will be even hotter, making for two record-setting years in a row. What’s more, as more heat is pumped into the ocean, climate models project a doubling in the frequency of extreme El Niño events in the future. Record ocean surface temperatures driving 2014’s heat demonstrate the ocean’s role as an important heat sink and are linked to unusual atmospheric patterns. Global average sea surface temperature (which is a conservative and incomplete cross-section of the ocean) has shown an alarming trend in 2014. From May through November, each month set a new record for global sea surface temperature anomaly (or departure from average), with June also setting a new record for the highest departure from average for any month. The record was short-lived, however, as June’s temperatures were quickly surpassed first in August and then again in September. A study analyzing the record ocean surface warming in 2014 finds that unusually warm surface temperatures in the North Pacific were largely responsible. While it is still too soon to know for sure, this could indicate the start of a new trend where the massive amount of heat being absorbed by the ocean is making its way to the surface, and getting reflected in surface temperatures. Oceanic warming is especially worrisome because it has broad and complex impacts on the global climate system. Most immediately, the ocean is connected to the atmosphere—the two systems work together to move heat and freshwater across latitudes to maintain a balanced climate. This is known as ocean-atmospheric coupling. Climate scientists are actively researching how changes in ocean and atmospheric heat content impact circulation patterns, in particular how changes in circulation affect the weather patterns that steer storms. For example, one recent analysis found that ocean warming might cause atmospheric precipitation bands to shift toward the poles, causing an increase in the intensity and frequency of extreme precipitation events at middle and high latitudes as well as a reduction in the same near the equator. Already, we are starting to experience patterns consistent with this kind of analysis. The amount of heat accumulating in the ocean is vital for diagnosing the Earth’s energy imbalance. Studies estimate that over 90 percent of the heat reaching the Earth is absorbed by the ocean and that over the past several decades, global warming has caused an increase in the heat content of both the upper and deep oceans. Recent observational data has indicated a slowing in the rate of ocean surface warming relative to other climate variables, which scientists have pinned to cool-surface La Niña episodes in the equatorial Pacific. However, it is important to remember that different regions of the ocean heat up differently, and global observational data often underreports changes in regions that are difficult to measure (such as around the poles or in the deep oceans). The deep oceans in particular are responsible for absorbing much of the excess heat. Deep ocean circulation patterns carry sun-warmed tropical waters into the higher latitudes where they sink and flow back towards the Equator, acting as a kind of buffer to climate change by slowing the rate of surface warming. In addition, research shows that three major ocean basins—the Equatorial Pacific, North Atlantic, and Southern Ocean—are important areas of ocean heat uptake and that observational data often fails to capture the full extent of actual warming in these regions. Despite the limitations associated with measuring changes in ocean heat content, however, we are still seeing record-breaking heat in the oceans. Unusual jet stream patterns, linked to warming in the Arctic and warmer sea surface temperatures in the Pacific, drove extreme drought in the western U.S. and chills in the East. Temperatures in the U.S. throughout 2014 were exceptional, marked by simultaneous record heat in the West and cooler than average temperatures in the East. While it may seem strange for global warming to sometimes be accompanied by colder winters, recent studies hold that warming in the Arctic and in the western Pacific Ocean has led to changes in the jet stream, which can result in volatile weather patterns and unusually persistent periods of extreme weather in the mid-northern latitudes. The avenues through which warming influences the jet stream represent a new and still emerging facet of climate science. Throughout 2013 and 2014, the jet stream frequently dipped from the Arctic to the south, creating a persistent dipole—or two opposed atmospheric pressure systems—with the Western U.S. receiving warm, high-pressure air from the Pacific, and the Eastern U.S. receiving Arctic air carried by the sunken jet stream. Arguably the most severe outgrowth of this recent trend in the U.S. has been the historic 2012-2014 California drought (which forecasters predict will continue into 2015). The state began 2014 with its lowest Sierra snowpack recording—12 percent—in more than 50 years of record keeping. 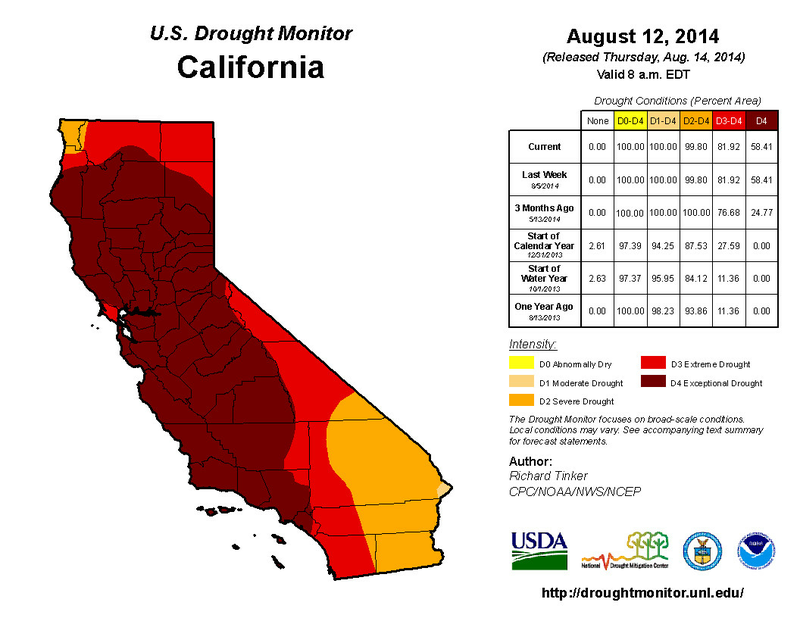 In August, California set a new U.S. Drought Monitor record with 58.4 percent of the state in the worst drought category, known as “exceptional drought.” The dry conditions along the West Coast also fueled a severe wildfire season. On August 2, California Governor Jerry Brown declared a state of emergency due to the ongoing drought, fires and deteriorating air quality throughout the state. Meanwhile, Oregon and Washington topped the nation in total number of acres burned, with Washington experiencing its largest wildfire ever recorded. By contrast, the Central and Eastern U.S. experienced unusually persistent cold temperatures throughout 2014. The winter of 2013-2014 was among the coldest on record for the Great Lakes, and Minnesota, Wisconsin, Michigan, Illinois, and Indiana each had winter temperatures that ranked among the ten coldest on record. Ice coverage over the Great Lakes peaked at 92.2 percent on March 6, the second highest measurement on record. The summer was also cooler than average for the region, which led into an unseasonably frigid fall. Several U.S. locations experienced their coldest Novembers on record due to a procession of cold fronts tapping air from the Arctic. At the start, the Arctic outbreak was largely the product of the extra-tropical remnant of Typhoon Nuri from the Pacific. The system was the most powerful storm to ever move over the Bering Sea, gaining strength from warmer than average ocean and atmospheric conditions. Due to its strength, the storm caused the jet stream to sink southward bringing Arctic conditions to the United States. As a result, North America snow cover reached a record extent for mid-November—15.35 million square kilometers—crushing the old record from 1985 by over two million square kilometers. On November 16, temperatures were warmer in Alaska (significantly in some cases) than in many Central and Eastern U.S. states. Arctic temperatures ran up to 40 degrees above average (with Fairbanks, Alaska blowing away old temperature records by almost two degrees), while the Central and Eastern U.S. experienced record snowfall and temperatures up to 40 degrees below average. Taken together, 2014 has witnessed a record-setting split in the U.S. between regions of simultaneous hot and cold temperatures. According to Scott Robeson, a climate scientist at Indiana University Bloomington, these hot and cold extremes are important. Robeson recently authored a studyon warm and cold anomalies in the northern hemisphere and found, “Average temperatures don’t tell us everything we need to know about climate change. Arguably, these cold extremes and warm extremes are the most important factors for human society.” Robeson notes that temperatures in the Northern Hemisphere are considerably more volatile than in the South, where there is less land mass to add complexity to weather systems. The extreme weather observed in 2014 in the U.S. has many layers of complexity, with ocean and Arctic temperatures influencing circulation patterns, and a growing body of scientificevidence suggests global warming may be the common denominator. Internationally, 2014 saw record heat and drought in some countries, but cold spells and flooding in others. As in the U.S., many of these trends are associated with unusual ocean-atmospheric circulation patterns with likely connections to climate change. Perturbations in the jet stream have wide ranging climate impacts that vary depending on geographical region. One recent analysis finds a connection between a wavy jet stream pattern—with greater dips from north to south—and increases in the probabilities of heat waves in western North America and central Asia; cold outbreaks in eastern North America; droughts in central North America, Europe and central Asia; and wet spells in western Asia. Just as most of the weather in the western U.S. is below the jet stream and connected to the Pacific, most of the weather in Europe rides in under the jet stream from the Atlantic. While the jet stream has been unusually far north in the Pacific, bringing high temperatures and drought to the western U.S., the jet stream has been unusually far south across the Atlantic. As a result, the UK was hit by an exceptional run of winter storms and an intense polar vortex at the start of 2014, with rainfall amounts, storm intensities, wave heights, and other extreme weather trends at or near record levels. Related damages from December 23, 2013 – March 1, 2014 added up to $1.5 billion. Global warming has doubled the risk of extreme conditions, as warmer temperatures and melting ice in the Arctic cause the jet stream to push cold air southwards. In January and February, an exceptional dry spell hit Southeast Asia, with the worst impacts—including water shortages, wildfires, crop failure, and increased incidence of infectious disease—felt in Singapore, Malaysia, Indonesia, and Thailand. Singapore suffered its longest dry spell on record between January 13 and February 8, which caused extensive damage to rice crops and fish stocks at several offshore farms. Dengue hotspots in Malaysia experienced a four-fold increase in infections to about 14,000 compared with the same period last year. Continuous, heavy rainfall in May resulted in some of the worst flooding ever recorded in Southeast Europe, mainly Serbia, Bosnia and Herzegovina (BiH), and Croatia. Three months’ worth of rain fell in only three days, making it the heaviest rainfall in BiH since records began in 1894. On May 15, the Serbian Government declared a state of emergency for its entire territory. The storm caused $4.5 billion in damage. May also saw the Eastern Pacific’s strongest May hurricane on record, Hurricane Amanda, which peaked as a top-end Category 4 hurricane with 155 mph winds. The impressive hurricane was linked to record sea surface temperatures, which measured 0.59°C above the 20th century average of 16.3°C, the highest temperature anomaly on record for May. In July in the Western Pacific, Typhoon Rammasun became the strongest typhoon to hit China’s Hainan Province in 21 years, surprising forecasters as it gained more strength than anticipated. Like Amanda, wind speeds topped out around 155 mph. The typhoon remained very strong as it made landfall, leading to extreme rainfall and flooding in China that caused $7.2 billion in damage. Global warming is expected to increase the rainfall from tropical cyclones. Following the wettest January to August on record, the UK experienced its driest September since records began in 1910, receiving 19.4mm of rain, or 20 percent of the expected average. Monthly temperatures in the UK were also significantly above average. One recent study finds that human-caused global warming has increased the chances of extremely hot summers in parts of Europe tenfold. The UK Met Office is currently researching how jet stream variations and changes to atmospheric circulation may be increasing the risk of patterns that slow the movement of weather systems, allowing heat waves to develop and intensify. Three of the major global temperature datasets that combine both ocean and atmospheric temperatures have declared 2014 the hottest year on record. The 10 warmest years on record according to the NOAA and NASA datasets. The four most highly cited combined SST and land temperature datasets are NOAA’s MLOST, NASA’s GISTEMP, the UK’s HadCRUT, and the JMA’s CLIMAT. While HadCRUT has yet to confirm, NOAA, NASA and the JMA—using independent data and analysis—have decalred 2014 the hottest year on record. The Japanese Meteorological Agency (JMA) was one of the first agencies to report 2014’s heat record in a preliminary analysis and found that 2014’s global temperature was 0.63°C above average. NOAA’s data holds that 2014’s temperature was 0.69°C above average, and NASA that it was 0.68°C above average. Satellites that measure temperatures in the lower atmosphere, or troposphere, did not rank 2014 as a record year, but the troposphere is only one region where excess heat gets stored. Because satellite datasets measure the atmosphere, and not the climate system as a whole, it is inaccurate to compare satellite temperature averages with combined land and SST averages. Combined land and SST datasets are based on instrumental readings taken on site in the ocean and atmosphere, while satellite records focus on the troposphere and infer temperatures at various levels using measurements of radiance (the intensity of radiation passing through a point in a given direction). Both types of datasets improve our understanding of the rate at which the Earth is warming and how the climate system as a whole distributes heat. But because the two types of datasets vary in terms of their scope, it is perfectly possible for the atmospheric temperature average, as measured by satellites, not to set a new record, while the global combined land and SST average does. This was the case in 2014. The two most widely cited satellite records are the University of Alabama in Huntsville (UAH) and the privately owned Remote Sensing Systems (RSS) datasets. According to the RSS data, 2014’s annual average temperature in the lower troposphere was the sixth warmest on record, or 0.26°C above the long-term average. The UAH data has not yet been confirmed, but will likely reaffirm the RSS finding. This is to be expected, however, in a year where record ocean heat was the dominant driver of observed warming. Temperature analyses provide an important health gauge for the planet. The instrumental temperature record—based on readings from ships and buoys that measure sea-surface temperature (SST) as well as land-based weather stations—has provided vital information about the Earth’s climate over the last century and beyond. To reconstruct global temperatures, each agency divides the Earth’s surface into latitude-longitude grid boxes that are used to integrate in situ (“on site”) temperature measurements from around the globe. The three most highly cited combined SST and land temperature datasets are NOAA’s MLOST, NASA’s GISTEMP, and the UK’s HadCRUT. All three datasets report global average temperature as an anomaly, or departure from average, relative to a reference period. This is because absolute temperatures can vary (depending on factors like elevation), whereas anomalies allow for more meaningful comparisons between locations and accurate calculations of temperature trends. HadCRUT uses the most recent reference period to calculate anomalies, 1961-1990, followed by GISTEMP’s 1951-1980 period. MLOST, on the other hand, uses the 20th century, 1901-2000, as its reference period to establish a longer-term average. While the concept of these datasets is fairly simple, their construction is challenging due to difficulties in obtaining data; documenting and accounting for changes in instrumentation and observing practices; addressing changes in station location and local land use; understanding random measurement errors; and deciding where and how to fill in missing data in space and time. Each group has approached the above challenges somewhat differently. The final datasets differ in their spatial coverage, spatial resolution, starting year, and degree of interpolation (a method of constructing missing data points based on surrounding, discrete points). For this reason, NOAA, NASA, and UK Met Office global temperature anomalies vary subtly. Global temperature data often underestimates the amount of warming due to coverage bias. Analyzing temperature observations at a global scale often comes at the cost of not including important spatial detail. This challenge—known as coverage bias—is something all three of the major global temperature datasets struggle with and attempt to reconcile. NOAA’s Merged Land-Ocean Surface Temperature Analysis (MLOST) uses land surface air temperatures taken from the Global Historical Climatology Network (GHCN) dataset and ocean temperatures from the Extended Reconstructed Sea Surface Temperature (ERSST) dataset, and combines these into a comprehensive global surface temperature dataset. The comprehensive dataset spans from 1880 to the present at monthly resolution on a 5×5 degree latitude-longitude grid. MLOST uses interpolation, but areas without enough data—mainly at the poles, over Africa, and at the center of the Atlantic and Pacific Oceans—are masked in the data analysis to prevent any overreliance on reconstructions that are based on too little data. NASA Goddard’s Global Surface Temperature Analysis (GISTEMP) also uses GHCN data from 1880 to the present, but GISTEMP has some important differences from NOAA’s MLOST. While GISTEMP has a more focused spatial resolution, with a 2×2 grid, and better coverage at the poles due to the inclusion of data from Antarctic “READER” stations, it only provides data in terms of temperature anomalies. All three of the major global datasets report global temperatures as anomalies to make comparison and computation easier, but GISTEMP is unique in that it works solely with anomaly data from the outset. NOAA and HadCRUT have absolute temperature data from which they derive regional anomalies. As for HadCRUT, it is unique in that it incorporates many additional sources beyond GHCN and is the only global analysis that does not use interpolation. It also has more spatial coverage gaps than MLOST and GISTEMP and a tendency to significantly underreport warming, primarily due to a lack of temperature data at the Arctic, which is warming much fasterthan other regions.